IHeart Organizing: Five Simple Tips to Organize, Print and Enjoy Your Photos! 43 Five Simple Tips to Organize, Print and Enjoy Your Photos! Although I am no professional, I have really grown a passion for photography. Not only do I enjoy the creative aspect of photography, I love capturing moments in time that can be cherished and passed on for years to come. I love taking photos of the little things that I never want to forget. Photos of our friends, family, pets and home. Vacation photos and important milestones in our children's day to day lives. As much as I love taking photos, I am incredibly guilty of not following through with them after the fact. They sit on my camera card, then on my computer and then on my external hard drive. I was just saying to my husband last night that I haven't updated the photos on our walls in YEARS! But at the same time, I find so much joy in walking down our hallway and looking at the photos we do have displayed. This year my goal was to be better about balancing my time between my blog life and home life. And that doesn't just mean my time, it also means capturing those important moments and picking up my camera more for my hobby and family. More importantly, it means getting those photos off of my camera and computer and doing something with them. Filling the walls of our home with them and even putting them into albums so they can continue to be appreciated. I know I am not alone in this. I hear so frequently that organizing and printing photos can become an overwhelming process. That is why I asked my beautiful friend, Jennifer Chaney, to stop by and share her tips with all of us today. Jennifer is an amazing professional photographer, and has put together some really simple tips for us to take control of our digital photos. 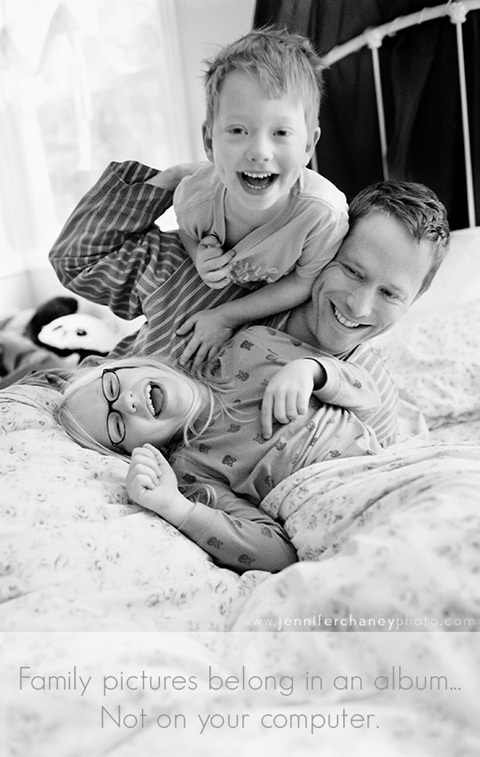 Jennifer Chaney is a San Francisco Bay Area family photographer, mom blogger and small business consultant. When she is not dancing i the kitchen with her crazy kids, she is blogging about photography and family life, or working on her first parenting book. Life is never dull and she could use a third arm. On a professional note, Jennifer has had her photography on CBS Good Morning America, People.com, as well as published internationally on several occasions. Recently her work was featured in the Wall Street Journal along with an interview regarding family photography and the holidays. Some of her photos are also slated to run in O Magazine later this year. Jennifer's photography tips have been featured in Parade magazine, USA Today, Washington Post, The LA Times, San Jose Mercury News, The Sacramento Bee and more. Organize, Print and Enjoy! Get Those Photos Off Of Your Computer! So badly I want to blame the advances in digital photography and my smartphone, but really it is just me and my lack of prioritization for my personal photos. I'm here to help you. There are several things I learned when I went through the process of organizing my pictures and I'm sharing my top 5 organizational tips here! With a bit of effort, time and minimal tears, you'll shed that extra guilt and enjoy your newly found freedom. As with any large project, you need to give 100% to it until it’s done. If you’re not honest with the time commitment it needs, then you’ll likely get discouraged and wind up calling it quits long before you’re done. And I think we can all agree that unfinished projects only add to our guilt. Who needs more of that? I found that this project could generally be done in about 6 weeks with a commitment of 1 hour a night. Some nights you’ll need more time and others less. But if you mentally prepare for 1 hour, you’ll get it done much faster. Also, one hour is such a doable time period. I don’t think the people who took the online class would have had the same success rate had they committed to a greater time period. Many said they actually finished the assignments sooner because they got so involved in the photos that two hours had passed before they knew it. If you’re not already backing up your family pictures (and documents! ), it’s time to start. And certainly don’t take on a massive photo project without being sure you’re backed up to either the cloud or an external hard drive. Accidentally deleted photos can be quickly recovered from cloud based backup companies like Crashplan, or if you prefer an external hard drive, Seagate Backup Plus got good reviews on Amazon.com and CNET. I cannot stress enough how important it is to back up your photos. Even though we’re positive we won’t mistakenly delete or overwrite a file, it happens to the best of us. I lost our family photos of our first trip to Disneyland (I know! Can you imagine?). I got a little overzealous when moving things around that I inadvertently deleted our entire trip! Luckily I was able to recover them from Crashplan with minimal effort. And I’m not the only one who experienced a “photo snafu”. Around week four of my class I was coming out of Apple and ran into one of the gals taking the organization class… she was taking in her mac to get help recovering overwritten files. At some point during the class she wrote over several years worth of pictures. Fortunately Apple’s Genius Bar was able to help her out. Backing up your pictures before you start is critical. When you’re done, it’s a good idea to keep that online backup going. If you’re like me, you take a ridiculous amount of pictures with your phone. For many of us wanting to stay organized this can be the kiss of death. But if you have a system in place, you’re less likely to get swallowed up by your massive mountain of family pictures again. I’ve found that the key to good picture organization is easy to read names for both the pictures and the folders they will live in on your computer. This will allow you to quickly sort and identify your pictures. For each photo file, I suggest naming it by using the year, month and brief description: “2012 07 lake Tahoe – swim lessons- pony ride” This is best when done when importing from your phone or camera. Once you have them renamed, you need to file them away in folders. Folders on your computer are like shoe cubbies in your closet. They keep everything in neat and easy to access. In the class I focused on an easy to follow system. When you upload the photos from your phone or camera, put them in a master family photo folder. Within that folder you have sub-folders by year. 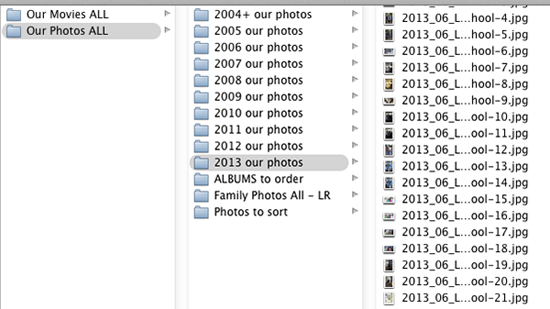 Each year contains the photos from that year with the same naming convention for easy sorting. If you train yourself to name and file your pictures each time you upload them, you’ll avoid the guilt surrounding unmanaged photos. And printing albums and prints will be a snap since you’ve named them all chronologically. When I mentioned that I lost our Disneyland photos I’m sure many of you bristled at the thought. “What?! You lost photos from your first trip to Disneyland? You deleted the pictures of your kid’s wide-eyed stares and awe of their first encounter with Finding Nemo Submarine Voyage? Next you probably felt a little pity. I did too. I’m not going to lie and say that I wasn’t near tears when I opened the Disney folder and found that it was empty. I was practically shaking. But after about an hour of frantically searching for the missing pictures it started to sink in… that the pictures were gone and I lost the only memories of my kid’s first trip to Disneyland. And then it hit me. Wait a minute? Wasn’t I there? Don’t I remember what their faces looked like? What about their laughter? Don’t I remember hearing the squeals of joy as we hopped in the teacups for what seemed like the 40th time? Yes. I remember it all vividly. I don’t need the pictures to help me remember. As it turns out I was able to recover the vast majority of the photos. The missing ones are gone for good, but I’m totally okay with that. In fact I support “deleting” photos on a regular basis. As you’re taking the pictures and when they’re on your computer. 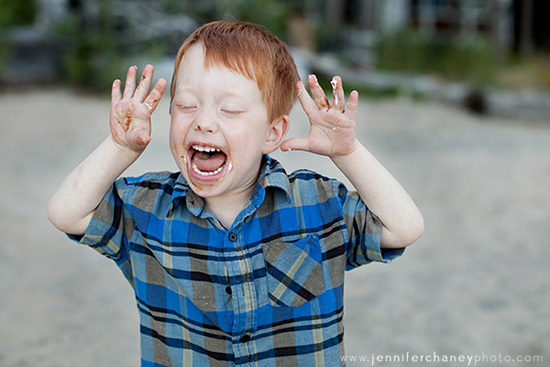 In the photo above, I have about 6 versions of this crazy kid. I picked this one and deleted the rest. It’s important to keep only the photos that really matter. If we save every last photo we take, we are only setting ourselves up for failure. Remember the more photos you have, the more you have to organize and print up later. Don’t stress. It’s more important to be in the moment with our kids rather than dancing around like a maniac determined to photograph every single moment of an event. Much like decorating a room, decide what you need first, and then move forward. Otherwise you’ll go on a spending spree and stuff your living room full of unnecessary (and often unwanted) baubles and bits. If you really want to stay organized, you need to learn how to survive with fewer pictures. Don’t worry, it’s easier than you think. In many respects I consider myself the anti-photograph photographer. Not only do I suggest that we stop putting quite so much stock in the pictures we have (as mentioned above), but I also suggest we all take fewer photos. When sifting through over 10,000 pictures from just three years it will dawn on you that it’s possible that you take too many photos. Well I’m here to tell you that it’s not only possible, but it’s true. You are taking too many pictures. We all are. We’ve gotten to the point where we are taking multiple pictures every single day. It’s time to ask ourselves if it’s really necessary? The answer is no. It’s not necessary, but I do have a solution for our trigger-happy fingers – slow down. If we stop jumping up to snap a picture every time our child does something cute, and rather wait for the right moment, we will a) take fewer pictures, and b) take pictures that really matter. Before you take the pictures, ask yourself a couple of questions: What will I do with this photo? What does it say? Another photo trick is to try to get more into one picture. Above I have one photo with just my boy and the next shot his sister is running into the frame. This is great because now I can keep just one picture from our day at the park. In the end the best way to be organized is to reduce clutter. And this goes for pictures, too. Organizing my photos not only helped me get the digital pictures off of my computer, but it also taught me a few life lessons. You can read all about my other photo discoveries on my blog… bad haircuts included! The photo organization class was a big success and to spread the organization goodness, I’ve compiled all of the lessons into an easy to follow ebook. Everyone who signs up for my photo news, tips and tricks monthly email will receive a complimentary copy: Take Control of Your Digital Pictures. I love this so much! And she is so right. We go to the park so often in the summer, do I really need to take 100 pictures every time? Probably not. Maybe one to remember the day, but not 100. Goes to show that less is more, even with photography. A huge Thank YOU goes out to the sweet Jennifer for stopping by to share these inspiring and helpful tips! I know I am excited to start deleting and filing away my favorites so I can move forward with printing and album making. I totally understand! We take so many pictures, we could fill two albums a year with no problem. Me: I want as many albums as I need - about seven or eight. These ones are purely for me; my kids can throw them away when I’m gone because they’ll have their own albums. My children: Four albums total for each child. Coffee Table Books: One per year - these are left out for friends and family to flip through. Affordable books that I won't panic about someone ripping or getting dirty. Shoot me an email if you have more questions. I'm happy to help! I'm not great about printing my pictures since it typically means taking down old ones since our walls are already full. However, I am reasonably good at updating our large (19") digital picture frame. It sits in a very visible spot in our family room/kitchen. We have about 600 photos rotating every few seconds and it is so easy to add to. Add that to the 'low risk' feeling of digital and the enjoyment on my son's face when he sees a shot he hasn't noticed before and I've managed to stay motivated and on top of this one. I highly recommend it as a way to really see more of your precious pictures. Great tips! I really needed this information. Thanks Jennifer. Wonderful article! I just got a new Macbook Air and am slowly trying to organize things on here versus a PC based system....huge learning curve but essential in backing up our photos! Yes, back up back up back up!!! I use Crashplan too and it saved me BIG TIME a few months ago when my entire computer died and the hard drive could not be recovered. I would have lost everything from my business, blog and personal life - not just photos but other important files. Great post all round but particularly wanted to comment on that point as it's so important. What a nice surprise to go onto one of my favorite blogs and find one of my most favorite people! Delightful to see the oh so talented and fabulous (especially in that fro) Jennifer Chaney on here! 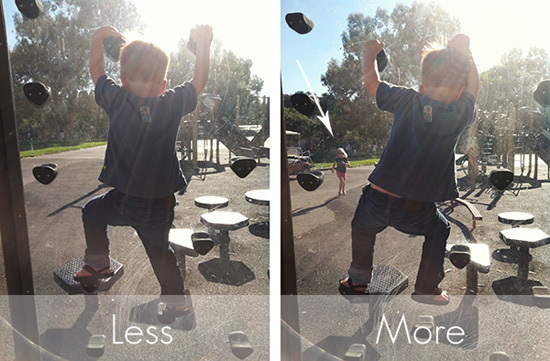 This are such great tips- especially the one about not taking too many pictures! Sometimes I import my photos and am just overwhelmed! I just made yearbooks for this year & last year and definitely like having some pictures printed out! Wonderful post packed with tips. My husband has been faithfully organizing our family pics but I'm responsible for my own work related ones and my system -what system?- needs corrections! The most important advice for me is "commit to it 100%!" Thank you for the post! I was just organizing my photos yesterday! This post will definitely help me out while I continue organizing today. Thank you! I certainly struggle with the photo organizing too...all aspects! I need to get on that! But one thing that we do that I LOVE and works so well for our family has been a seasonal wall. I have a small gallery in our main hall....it holds 10 photos. I change them multiple times a year with the seasons (fall, Christmas, beach, etc.). Most of my favorites are usually seasonal anyway, and I didn't like displaying Christmas pics in the middle of the summer, etc. I also feel less pressure to get the "perfect"picture hung because I know it will change in a month or two. As for every other frame in my house....hasn't been touched in years....oops! I'm a scrapbooker so I stay on top of my digital pictures pretty well. Just thought I'd add a few things I do that are helpful. 1. When I move the photos off my camera onto my computer, I also hook up my phone and move over those photos as well. Chances are, someone who was at my daughters birthday party text me pictures they took with their phone, and so I probably have photos on my camera and phone from the same event. 2. I dump all the photos directly into one folder on my desktop, immediately go through them and discard what I don't want to keep. If I do want to keep it, but don't plan on using it in the scrapbook, I will just move it to another folder. 3. The folder stays on my desktop until I print them out (usually once a month I do this). That way I know exactly what I need to print, I don't have to search through the yearly albums to find what I need to upload, and I don't accidentally print off something I already printed 2 months ago (ending up with more photos printed than I actually need, and spending money that didn't need to be spent). 4. Once the photos are uploaded and ordered (I use Sam's Club Photo and Snapfish) I then move them to the folders where they will live for eternity. That's is something that I still have to tackle: my photographs. The printed ones and the digital ones. Great tips!! Thank you so much for the photo tips! I need to do this ASAP before my computer crashes from too many photos. :-) I agree that taking fewer pictures means less to organize & store. There are several free websites to store your photos. I made 2 photo books using shutterfly.com. If you don't organize your albums on the site they do it for you. Unless you order prints or use their site to create calendars, memory books, or many other products the storage is free & I think, always accessible no matter what happens to my hardware. I also saw a flash drive in a catalog recently that claims it will find every photo on your computer and automatically move them to that flash drive. I do not throw out originals but once they're uploaded I have little use for them so they do go back in albums. Yes! This is a part of organizing that I have always struggled with. I'm terrible about printing photos (ink and photo paper is so expensive!) and even worse about keeping them all in one place. This is exactly what I've needed! I loved this post. I am the absolute WORST when it comes to family photography. As embarrassing and sad as it is to admit, I don't even take many pictures of our family because I get overwhelmed by what comes after. This will really help me get it in gear! What about iPhoto? My phone automatically uploads to iPhoto and while I love being able to view them so easily in there, it adds to my photo confusion. I end up making duplicate folders on my computer to back up to the hard drive but now I feel like I just have twice as many unorganized photos! Any tips for using (or not using) iPhoto? What do you use instead of iPhoto??? I have had a Mac for over 2 years and have not done anything with my photos that I have on hard drives or memory cards because I do not like iPhoto. I have asked all my friends but they all love iPhoto. I just don't like that I am not in control of where the photos are and I don't want to order from the options in iPhoto. Janell, I use Lightroom. And I totally get what you're staying... iPhoto thinks for us, but I don't like the way it thinks, so I turned it off! Wonderful tips! New Year's Eve I sat down with a mini chipboard album and a stack of 50 favorite pictures to sum up 2013 and got them on the pages. It was hard picking so few pictures but I reminded myself I didn't need to print multiplies of one child doing the same thing. One picture tells the story. It feels good to have 2013s album done and ready to look back on. I'm eager now to start 2014 and also catch up on our 6 children's baby books. Thanks for the great post! Christina, you have not idea how much I loved reading your comment! It made my day!!! Good for you! We all need to follow your lead! I loved this post! I noticed recently that I have taken 15000+ pictures on my digital camera in 4.5 years. OMG! Talk about overwhelming. I started being ruthless about deleting before I even get the photos off my camera. I think I need to be more ruthless in just not taking as many photos, as you suggest. And my biggest barrier to all of this: TIME! An hour a day sounds like a lot when trying to make sure I am fitting in time with the hubby, kids, dogs, work, etc. I will say that I am good about pulling the pictures off my camera about once/month, and I have them on my computer and loaded onto Shutterfly. At a minimum, I can get them from there if anything ever happens to the pc (knock on wood). As for printing, I was terrible. I do make a photobook each year for my kids with just a two-page spread for each month. It makes me really be selective about what I choose for their photobook. As for printing for me, I started making a photobook a year. I chose photobooks because you can put as many pictures as you want, and still have a flat, thin album. I appreciate this post so much. I am trying to organize photos and print albums before my second child is born, and this is just the push I needed! Not taking as many pictures aligns with my goal to be more "in the moment" with my sweet little girl. Sometimes I get so wrapped up in capturing moments that I forget to actually be "present". Thank you so much for sharing that you aren't always on top of your own photos even though you are a photographer. I think you must made millions of time starved moms feel much better :) And your tips made it simple and clear to implement a few easy changes to get a handle on them. For those times when you just need the extra help you can hire someone to manage your photos for you. 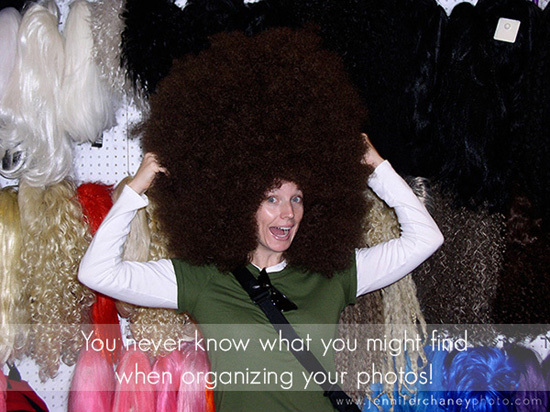 Search personal photo organizers and you can find someone in your area to help. Great solution when you are getting too far behind and just need a boost. Thanks for the great info! I read a decluttering book where the author became so frustrated with photos... the self-induced pressure to capture every moment only to have them clog and clutter his mind (and his hard drives)... that he just put his camera down, deleted the files and comitted to never sacrifice the moment to capture the picture or to organize/scrapbook/print them. I can totally relate to the overwhelm factor. I spent an entire week of vacation organizing about 10 years of photos. To lose them all. ALL. Thankfully about 90% were salvaged. But I learned through that whole ordeal to 1) dump my camera regularly, 2) back them up, and 3) delete duplicates (picking the best 1 out of 12 shots... and moving on), 3) take WAY less pictures, 4) keep new stuff as organized as the old stuff. I will say... I can't put down my phone or my camera or "delete all" like the book author... but what you've said here is all true. Great tips... they're all working for me! Carrie, that sounds fantastic! If you remember the name of the book, will you post it? Thank you! We use Photoshop Element to upload our photos from our camera to the computer. This makes all the photos go on the computer by date. There's no way I'm gonna rename all the folders!!! Element allows you to tag the pictures. So, for exemple, if I have tag all the Disney land photos, when I search by entering "disney land" element will show me all the photos I want. And if I add "disney land" + the name of my daughter, it will show me all the picture of disney land with my daughter on it. If I want, I can also put stars on the photos I like the most but still keep the other one. I have found that many years later, I sometimes like the photos I didn't like that much then. I love that you're so organized! I LOVE me some Jen Chaney!!! Took her organization class and I've actually been taking less pictures and am (slowly) becoming friends with the delete button. SPC girls rock! DAWN!!!! You're so cute! Thank you, darlin! Check out Ahni and Zoe for some great and easy photo solutions!! Love the new products!! Check out Ahni & Zoe for some great photo solutions!! I love the new products (albums and apps)!! This is exactly what I needed to read! I'd love to see more on photo organization like this! Thanks! If you are using Windows you might consider Photo Manager. It's inexpensive ($14.95) and super easy to use. It will sort all your photos into a Year/Month folders with just a few mouse clicks (see a demo on YouTube: http://youtu.be/Ov50hIQ7Gc4 ). For printing and sharing you can also create sets from your collection by selecting entire folder or single photos and copying them to a new location.